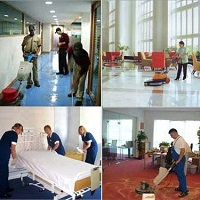 We have hired a big team of housekeeping professionals and workers. Our comprehensive House Keeping Services include cleaning, mopping, scrubbing, dusting, garbage collection etc. We are situated in Ghaziabad, Uttar Pradesh (UP) and offer our services at very nominal charges. The workers hired with us are adept at operating various modern machines. They also listen to the instructions given by the clients very attentively. We provide services for residential & commercial properties, and also to factories, corporate houses, townships and hotels.